Actress Patricia Arquette has fangs, the Snooze Button Generation has learned through anecdotal evidence and extensive Internet research. The SBG noticed the fangs during a viewing of the 1993 film "True Romance," then confirmed the fangs through google images. Strangely, only about 2 percent of her images show Arquette's teeth. "We take great pride in our scoops," Snooze Button Generation founder and CEO Joe Stevens said. "Our staff did an excellent job with this one. I'm surprised Arquette smiles so much with her mouth closed. 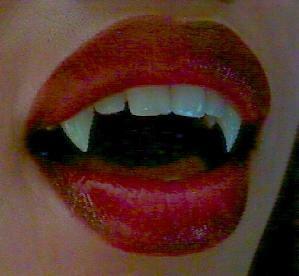 Fangs are something to be proud of." Arquette comes from a showbiz family that includes Rosanna Arquette, David Arquette and transvestite Alexis Arquette. Patricia Arquette is the most successful of the family because of her fangs. The top three movies of any of the Arquettes are "Pulp Fiction," "Desperately Seeking Susan" and "True Romance." Rosanna was in the first two of that list, but Patricia was in "True Romance," her tour de force. I love the title "True Romance." Hey, man, I'm not sure what true romance exactly entails, but replacing "I love you" with "You're so cool" and having that xylophoney music from Hans Zimmer is a great start.